New Age Global Builders can provide you with top grade scaffolding that will protect your commercial or residential building in Queens, NYC and the surrounding boroughs during renovations. 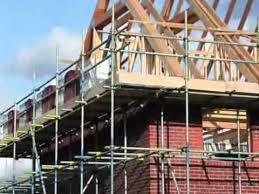 Our Scaffolding will also provide access to the façade to ensure the safety of the contractor along with easy access to the work being done. We offer contracting services for both residential and commercial building contractor services, office buildouts, office building contractors and office space renovations. We are insured and licensed commercial and residential NYC building contractors. New Age Global Builders Estimators will work with the building owner or contractor to accommodate the needs which arise from the renovation being preformed. Any intricacies regarding the building’s unique shape and size will be addressed. We know Queens and the sorrounding boroughs of NYC are known for tight and odd shapes structures. This includes the number and placement of doors in the enclosure face, whether a roof is desired on the enclosure, or how many levels of decking a contractor will need on the internal supported scaffold.